Persistent pulmonary hypertension of the newborn (PPHN) is defined as the failure of the normal circulatory transition that occurs after birth. It is a syndrome characterized by marked pulmonary hypertension that causes hypoxemia secondary to right-to-left shunting of blood at the foramen ovale and ductus arteriosus. Idiopathic persistent pulmonary hypertension of the newborn can present without signs of acute perinatal distress. Marked lability in oxygenation is frequently part of the clinical history. Echocardiography is considered the most reliable noninvasive test to establish the diagnosis, assess cardiac function, and exclude associated structural heart disease. Meconium aspiration. Radiograph obtained shortly after birth shows ill-defined, predominantly perihilar opacities in the lungs; these are more severe on the right than on the left. The lungs are hyperexpanded. The neonate's heart size is within normal limits. The treatment strategy for PPHN is aimed at maintaining adequate systemic blood pressure, decreasing pulmonary vascular resistance, ensuring oxygen release to tissues, and minimizing lesions induced by high levels of inspired oxygen and ventilator high pressure settings. Because virtually all newborns are born with elevated pulmnary pressures and have a patent foramen ovale and a patent ductus arteriosus immediately after birth, the presence of elevated pulmonary vascular resistance beyond baseline (PPHN) may lead to a right-to-left shunting of blood and severe hypoxemia. With inadequate pulmonary perfusion, neonates are at risk for developing refractory hypoxemia, hypercarbia, and acidosis. Mechanisms that maintain high pulmonary vascular resistance (PVR) in utero include low fetal oxygen content, fluid-filled alveoli causing compression of the pulmonary blood vessels, and the presence of vasoconstrictor mediators, such as endothelin-1, thromboxane, and leukotriene. A dramatic cardiopulmonary transition occurs at birth, as pulmonary blood flow increases 8- to 10-fold and pulmonary arterial pressure decreases by 50% within 24 hours. This is due to a marked increase in oxygen tension, the establishment of an air-liquid interface, and rhythmic distention of the lungs from breathing. [6, 7] The most critical signals for these transitional changes are mechanical distention of the lungs, a decrease in carbon dioxide tension, and an increase in oxygen tension in the lungs. Endothelial nitric oxide (NO) production in the lungs increases after birth as a result of the increased blood flow and oxygenation. The NO then mediates pulmonary vasodilation via cyclic guanosine monophosphate (cGMP). Cyclic adenosine monophosphate (cAMP) is increased after birth by the arachidonic acid-prostacyclin pathway which promotes smooth muscle cell relaxation. In some newborns, this normal decrease in pulmonary vascular tone does not occur, resulting in PPHN. This results in shunting of blood away from the lungs and severe central hypoxemia. Severe PPHN can be associated with poor cardiac output and shock, signs of which include tachycardia, ashen or gray color, capillary refill time more than 3 seconds, oliguria, hypotension, and lactic acidosis. This is commonly seen when the ductus arteriosus is restrictive and right-to-left shunting is compromised at this level or at the foramen ovale. Several events take place after birth as a fetus transitions from placental gas exchange to that taken care of by the lungs. At birth, the umbilical cord is clamped, which removes the low-resistance placenta circulation and increases the systemic circulation. In addition, pulmonary blood pressure begins to rapidly fall, leading to an increase in pulmonary blood flow. The drop in pulmonary vascular resistance is due to several factors, including ventilation of the lungs causing an increase in oxygen tension and the release of several vasoactive factors by the pulmonary endothelium, including endothelin-1 (ET-1), nitric oxide (NO), and prostacyclin (PGI2). Endothelial nitric oxide synthase (eNOS) (or nitric oxide synthase type 3) is the most extensively studied enzyme in persistent pulmonary hypertension of the newborn (PPHN). When activated by shear stress or adenosine triphosphate (ATP), it converts L-arginine into NO and L-citrullin. Experimental studies of chronic pulmonary hypertension in newborn animals have demonstrated impaired endothelial release of NO and increased production of vasoconstrictors (eg, endothelin-1). Endothelin-1, a 21–amino acid polypeptide elaborated by the endothelium, is a vasoconstrictor to the pulmonary arteries and enhances oxygen formation that depletes NO bioavailability and promotes the growth of the pulmonary artery muscular layer. Genetic factors may increase susceptibility to pulmonary hypertension. Strong links between PPHN and polymorphisms of the carbamoyl phosphate synthase gene have been reported. However, the importance of this finding is uncertain, and further work is needed in this area. More recently, investigators have described an association between polymorphisms in urea cycle enzyme genes and PPHN; they reported three single-nucleotide polymorphisms (SNPs) (rs41272673, rs4399666, and rs2287599) in the carbamoyl phosphate synthase 1 gene (CPS1) were significantly associated with PPHN. Larger studies are needed to replicate these findings. Hypoplasia of the pulmonary vascular bed is another cause of persistent pulmonary hypertension of the newborn. Congenital diaphragmatic hernia is an abnormality of diaphragmatic development that allows the abdominal viscera to enter the chest and compress the lung, impairing growth. Oligohydramnios may also produce pulmonary hypoplasia and associated persistent pulmonary hypertension of the newborn. Idiopathic pulmonary hypertension accounts for approximately 10% of the cases of PPHN. It is caused by impaired pulmonary relaxation after birth in the absence of parenchymal lung disease. One cause of idiopathic PPHN is constriction, or premature closure of the ductus arteriosus in utero, which can occur after exposure to aspirin or nonsteroidal anti-inflammatory drugs (NSAIDs) (eg, ibuprofen, naproxen) during the third trimester. Evaluation of infants at autopsy shows significant remodeling of their pulmonary vasculature, with vascular wall thickening and smooth muscle hyperplasia. Furthermore, the smooth muscle extends to the level of the intra-acinar arteries, which does not normally occur until late in the postnatal period. As a result, infants do not vasodilate their pulmonary vessels adequately in response to birth-related stimuli, and they present with hypoxemia and hyperlucent lung fields on radiography, which is termed black lung PPHN. Persistent pulmonary hypertension of the newborn (PPHN) should be suspected in any newborn with profound and often labile hypoxemia. Infants will have a preductal and postductal saturation gradient difference of at least 10% (with preductal saturations being higher). These findings are not specific to PPHN and, therefore, it is important to rule out structural heart disease with an echocardiogram. Persistent pulmonary hypertension of the newborn (PPHN) most typically affects infants who are phenotypically normal, although PPHN occurs with higher frequency in newborns with Down syndrome  and structurally normal hearts. 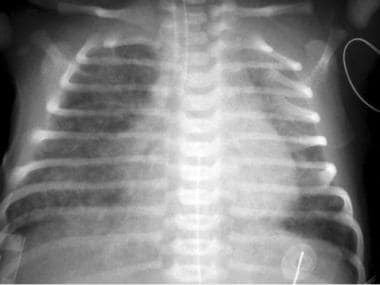 The most characteristic findings in an infant with PPHN are hypoxemia and a preductal-postductal saturation gradient. Infants will often have signs of respiratory distress, wide swings in arterial oxygenation levels due to acute changes in pulmonary blood flow and right-to-left shunting, and a cardiac examination revealing a loud second heart sound with a harsh murmur due to tricuspid regurgitation. The patient may also present with systemic hypotension and symptoms of shock with echocardiographic evidence of poor right ventricular systolic function. *PPHN can occur in isolation or as a result of any of the above diagnoses, with the exception of structural heart lesions. The studies discussed below are indicated in persistent pulmonary hypertension of the newborn (PPHN). A-a Gradient = [FiO2 × (PB – PH2O) – (PaCO2/0.8)] – PaO2, where FiO2 is the fraction of inspired oxygen, PB is the local barometric pressure, PH20 is the water vapor pressure, and 0.8 is the respiratory quotient. Be aware that the choice of sampling site can affect the ABG results. Newborns with PPHN frequently have right-to-left shunting across the patent ductus arteriosus. Therefore, preductal PaO2 values may be elevated when compared with postductal sites. Oxygenation is often assessed by using the oxygenation index (OI). The OI is calculated as the mean airway pressure multiplied by the FiO2, and this product is divided by the postductal PaO2 (see below). An OI of 40 typically prompts consideration of extracorporeal membrane oxygenation (ECMO) support. OI = (FiO2 × MAP × 100) / PaO2, where MAP is the mean arterial pressure. Evaluate the complete blood cell (CBC) count for a high hematocrit level, because polycythemia and hyperviscosity syndrome may produce or aggravate PPHN. The white blood cell (WBC) count and differential may help in determining whether an underlying sepsis or pneumonia is present. Laboratory tests to assess for coagulopathy includes a platelet count, prothrombin time (PT), partial thromboplastin time (PTT), and international normalized ratio (INR). If present, such coagulopathy may indicate sepsis and more severe disease. Monitor serum electrolyte and glucose levels initially and frequently. In particular, maintaining glucose and ionized calcium levels within the reference ranges is important, because hypoglycemia and hypocalcemia tend to worsen PPHN. Calcium is a critical cofactor for NO synthase activity. Chest radiography maybe useful in determining whether underlying parenchymal lung disease (eg, meconium aspiration syndrome, pneumonia, surfactant deficiency) is present. Chest radiography also assists in excluding underlying disorders, such as congenital diaphragmatic hernia. In newborns with idiopathic persistent pulmonary hypertension of the newborn (PPHN), the lung fields appear clear, with decreased vascular markings. The heart size is typically normal in infants with PPHN. The diagnosis of persistent pulmonary hypertension of the newborn (PPHN) should be suspected whenever the level of hypoxemia is out of proportion to the level of pulmonary disease. Echocardiography plays a major role in screening and assisting in making the diagnosis of PPHN. It is considered the most reliable, convenient, and noninvasive test to establish the diagnosis of PPHN, assess cardiac function, and rule out associated structural heart disease. Echocardiography with Doppler flow allows the physician to assess the presence and direction of the shunt at the ductus arteriosus and foramen ovale. It can estimate the pulmonary arterial systolic and diastolic pressures especially when the ductus arteriosus is restrictive. The right ventricle systolic pressure (RVSP) is estimated from the maximal tricuspid regurgitation flow velocity (v) in milliseconds and the estimated right atrial pressure (RAP) in the modified Bernoulli equation: RVSP = 4v2 + RAP. In newborns, a reasonable estimate of RAP is 5 mm Hg. Pulmonary diastolic pressure (PDP) can be estimated when pulmonary insufficiency is present as: PDP = 4V2 + RAP, where V is the insufficiency peak velocity. Right ventricular hypertrophy, bowing of the interventricular septum into the left ventricle, tricuspid regurgitation (TR), and right-to-left or bidirectional shunting at the patent foramen ovale and patent ductus arteriosus are the cardinal findings seen on echocardiography in infants with PPHN. Echocardiography is also used to define the anatomy of the pulmonary veins and to rule out obstructed total anomalous pulmonary venous return, which presents in a similar clinical scenario, prior to initiating extracorporeal membrane oxygenation (ECMO). Although rarely utilized, additional morphologic and functional information can be acquired by magnetic resonance imaging (MRI) and computed tomography (CT) of the chest tomography, if lung pathology is suspected. Perform cranial ultrasonography if extracorporeal membrane oxygenation (ECMO) is considered in a newborn, to evaluate for intraventricular bleeding and for peripheral areas of hemorrhage or infarct as systemic heparinization is necessary. Doppler flow studies can be a helpful adjunct in determining whether a nonhemorrhagic infarct is present. Continuous pulse oximetry screening is valuable in the ongoing treatment of the newborn with persistent pulmonary hypertension (PPHN), allowing the caregiver to assess the patient's oxygen saturation over time and as a guide to the adequacy of oxygen delivery at the tissue level. Oximeter probes can be placed on preductal (right hand) and postductal (feet) sites to assess for right-to-left shunting at the level of the foramen ovale and ductus arteriosus. A difference greater than 10% between preductal and postductal oxygen saturations correlates to right-to-left ductal shunting. Sites on the left hand should be avoided, because it may be preductal or postductal. Significant right-to-left shunting at the level of the foramen ovale may result in lower-than-expected preductal oxygen saturations (right hand), although a significant differential should still be evident when compared to postductal oxygen saturations. Cardiac catheterization is rarely utilized to confirm the diagnosis of PPHN because echocardiography is diagnostic in excluding complex congenital heart disease and in evaluating the severity of pulmonary artery hypertension. The risk/benefit ratio is also increased in this patient population when considering transportation of a sick newborn with PPHN to the catheterization laboratory and the possibility of precipitating a pulmonary hypertensive crisis during catheter manipulation. General management principles for the newborn with persistent pulmonary hypertension (PPHN) includes maintaining a normal body temperature and correction of electrolytes or glucose abnormalities and metabolic acidosis. The treatment strategy is aimed at maintaining adequate systemic blood pressure, decreasing pulmonary vascular resistance, ensuring oxygen release to tissues, and minimizing barotrauma induced by high levels of inspired oxygen and high ventilator pressure settings. The care of newborns with PPHN requires meticulous attention to detail. Continuous monitoring of oxygenation, blood pressure, and perfusion is critical. It is important for all those caring for sick newborns to use minimal stimulation and to minimize the use of invasive procedures, such as suctioning. Inhaled nitric oxide should be used to reduce the need for extracorporeal membrane oxygenation (ECMO) in term and near-term infants with PPHN or hypoxemic respiratory failure who have an oxygenation index that exceeds 25. Cardiac catheterization beyond the neonatal period should include acute vasoreactivity testing unless there is a specific contraindication. Genetic testing with counseling can be useful for children with idiopathic pulmonary artery hypertension (PAH) or in families with heritable PAH to define the pathogenesis, to determine family members at risk, and for family planning. Longitudinal care in an interdisciplinary pediatric pulmonary hypertension program is recommended for infants following congenital diaphragmatic hernia repair who have pulmonary hypertension or are at risk of developing late pulmonary hypertension. Extracorporeal membrane oxygenation (ECMO) is recommended for patients with congenital diaphragmatic hernia with severe pulmonary hypertension who do not respond to medical therapy. Screening for pulmonary hypertension by echocardiogram is recommended in infants with bronchopulmonary dysplasia. Evaluation and treatment of lung disease, including assessments for hypoxemia, aspiration, structural airway disease, and the need for changes in respiratory support, are recommended in infants with bronchopulmonary dysplasia and pulmonary hypertension before initiation of PAH-targeted therapy. Anticoagulation should not be used in young children with PAH because of concerns about harm from hemorrhagic complications. Optimal circulatory support is important to maintain adequate perfusion and maximize tissue oxygenation. Rapid infusion of colloid or crystalloid solutions, unless there is evidence of intravascular depletion, should be avoided as it results in a further increase in right atrial pressure which could lead to worsening of both the right-to-left shunting at the level of the foramen ovale and right ventricular systolic function. Inotropic support with dopamine, dobutamine, and/or milrinone is frequently helpful in maintaining adequate cardiac output and systemic blood pressure while avoiding excessive volume administration. Although dopamine is frequently used as a first-line agent, other agents, such as dobutamine and milrinone, are helpful when myocardial contractility is poor. Placement of a venous catheter into the umbilical vein (or other central vein) will allow for the administration of inotropic agents or hypertonic solutions (eg, calcium gluconate solution). Avoid catheter placement into the neck vessels, which should be saved for extracorporeal support, if needed. Surfactant therapy does not appear to be effective when PPHN is the primary diagnosis  ; however, it should be considered in patients with parenchymal lung disease, such as respiratory distress syndrome, meconium aspiration syndrome, pneumonia, or sepsis, which is often associated with surfactant deficiency, inactivation, or both. High-frequency ventilation (HFV) is another important modality if a newborn has underlying parenchymal lung disease with low lung volumes. This modality is best used in a center with physicians who are experienced in achieving and maintaining optimal lung distention. The response to HFV can be rapid, and care must be taken to prevent hypocarbia and lung overdistention. One criterion for the institution of ECMO is an elevated oxygenation index (OI) that is consistently 40 or higher. Veno-veno ECMO support can now be provided using a double-lumen catheter in the internal jugular vein; thus, veno-aterial ECMO and ligation of the right common carotid artery can be avoided. Although iNO is an effective selective pulmonary vasodilator, ECMO remains the only therapy that has been proven to be life-saving for PPHN. Therefore, timely transfer to an ECMO center is vital for newborns with severe PPHN. It is often difficult to determine the proper timing of a referral to an ECMO center. Referral and transfer should occur before refractory hypoxemia develops. Early consultation and discussion with clinicians at the ECMO center is strongly recommended. Identifying and maintaining communication with clinicians at an ECMO center is especially important given the widespread availability of iNO therapy. Continuous delivery of iNO is required during transport. The referring center is responsible for determining what transport capabilities are available in order to administer a successful therapeutic iNO program. Current ECMO entry criteria are suitable for situations in which newborns with PPHN respond well or not at all to iNO and/or high-frequency oscillatory treatment. In newborns with partial response to iNO and/or high-frequency oscillatory treatment, because ECMO criteria are never met, these patients may develop lung damage and even die waiting. Guidelines for transfer to an ECMO center for consultation are published on the ELSO Web site. Individual centers may have modified guidelines. Therefore, an ongoing relationship with the closest ECMO center is needed to provide optimal care. Baseline criteria for consideration for ECMO include an evaluation of risk factors, because of the invasive nature of the therapy and a need for heparinization. Endotracheal intubation and mechanical ventilation are almost always necessary for the newborn with PPHN. The goal of mechanical ventilation should be to maintain normal functional residual capacity (FRC) by recruiting areas of atelectasis, as well as to avoid overexpansion. Adjust ventilator settings to maintain normal lung expansion (ie, of approximately 9 ribs) on chest radiography. Monitoring of tidal volume and of pulmonary mechanics is frequently helpful in preventing overexpansion, which can elevate PVR, aggravate right-to-left shunting, and increase the risk for pneumothorax. In newborns with severe airspace disease who require high peak inspiratory pressures (ie, >30 cm water) or mean airway pressures (>15 cm water), consider HFV to reduce barotraumas and associated air leak syndrome. When HFV is used, the goal should still be to optimize lung expansion and FRC and to avoid overdistention. A frequent concern is determining the target arterial PaO2 level. Although hyperoxic ventilation continues to be a mainstay in the treatment of PPHN, surprisingly little is known about what oxygen concentrations maximize benefits and minimize risks. PaO2 levels of 50 mm Hg or more typically provide for adequate tissue oxygen delivery. Aiming for higher PaO2 concentrations may lead to increased ventilator support and barotrauma. Further, the use of extreme hyperoxia in PPHN management may be toxic to the developing lung, owing to the formation of reactive oxygen radicals. Newborns with PPHN nearly always require sedation to minimize agitation, which can increase pulmonary vascular resistance (PVR). Often morphine in combination with a benzodiazepine is used. Acidosis can act as a pulmonary vasoconstrictor and should be avoided. The use of sodium bicarbonate was common prior to the approval of iNO. Previous studies have shown that the pulmonary vascular response to alkalosis is transient, and prolonged alkalosis may paradoxically worsen pulmonary vascular tone, reactivity, and permeability leading to edema. Further, alkalosis causes cerebral constriction and reduces cerebral blood flow and oxygen delivery to the brain and thus might be associated with worse neurodevelopmental outcomes. Some still advocate using sodium bicarbonate infusions to maintain an alkaline pH. Serum sodium concentration should be carefully monitored if bicarbonate infusions are used, and ventilation must be adequate to allow for carbon dioxide clearance. Walsh-Sukys et al reported that the use of alkaline infusion is associated with an increased need for ECMO when the newborn is aged 28 days. Therefore, use this approach with caution. Many clinicians have good success without using alkalinization. In a series of 15 patients, Wung et al applied a strategy designed to maintain PaO2 at 50-70 mm Hg and PaCO2 at less than 60 mm Hg (ie, gentle ventilation). This approach resulted in excellent outcomes and a low incidence of chronic lung disease. The use of paralytic agents is highly controversial and is typically reserved for newborns who cannot be treated with sedatives alone. Be aware that paralysis, in particular with pancuronium, may promote atelectasis of dependent lung regions and promote ventilation-perfusion mismatch. In addition to oxygen supplementation, therapeutic strategies to manage persistent pulmonary hypertension of the newborn (PPHN) include lung recruitment with optimal mean airway pressure, surfactant (especially if meconium aspiration syndrome or respiratory distress syndrome is suspected), and the use of inhaled and intravenous vasodilators. Sedation with morphine along with a benzodiazepine is often necessary to prevent any agitation, which may worsen the PPHH. A randomized study showed that beginning iNO at an earlier point in the disease course (for an OI of 15-25) did not decrease the incidence of ECMO and/or death or improve other patient outcomes, including the incidence of neurodevelopmental impairment. The use of iNO has not been demonstrated to reduce the need for ECMO in newborns with congenital diaphragmatic hernia. In these newborns, iNO should be used in non-ECMO centers to allow for acute stabilization, followed by immediate transfer to a center that can provide ECMO. Contraindications to iNO include congenital heart disease characterized by ductal dependent systemic blood flow (eg, interrupted aortic arch, critical aortic stenosis, hypoplastic left heart syndrome) and severe left ventricular dysfunction. In infants who respond, an improvement in oxygenation is evident within few minutes. Some studies have shown that concentrations as low as 5 ppm are effective in improving oxygenation. [39, 40] Lower concentrations (2 ppm) are not effective. Once initiated, iNO should be gradually weaned to prevent rebound vasoconstriction. During iNO treatment, continuous monitoring of nitrogen dioxide and daily serum levels of methemoglobin should be obtained (methemoglobin levels should be kept at < 5%). Appropriate lung recruitment and expansion are essential to achieve the best response. If a newborn has severe parenchymal lung disease and PPHN, strategies such as high-frequency ventilation (HFV) may be required. Its use requires permanent vascular access as it has very short half life (~5 min), and any abrupt interruption in its delivery due to catheter dislodgment, blockage, or leak may result in potentially fatal rebound pulmonary hypertension. Its effect can wean overtime owing to the phenomenon of tachyphylaxis. Commonly observed adverse effects are due to systemic vasodilation and include headache, dizziness, facial flushing, jaw pain, leg cramps, and gastrointestinal upset. Among the 11 isoforms of phosphodiesterases (PDEs), the most important are the PDE3 and PDE5 isoforms, which degrade cyclic adenosine monophosphate (cAMP) and cyclic guanosine monophosphate (cGMP), respectively. In a Cochrane meta-analysis with 37 newborns from centers that did not have access to iNO and HFV, significant improvement in oxygenation was observed in the group receiving sildenafil. This study noted that sildenafil may be a treatment option for PPHN. The development of the endothelin receptor antagonists represents an important milestone in the therapeutic approach for pulmonary hypertension. Magnesium sulfate promotes vasodilatation by antagonizing the entry of calcium ions into the smooth muscle cells. However, its pulmonary vasodilator properties have not been studied in the adult or pediatric population. Combination therapy offers a greater option to enhance pulmonary vasodilatation compared with monotherapy. For example, iNO can work synergistically with PDE-5 inhibitors to increase cGMP levels; prostacyclin (PGI2) (which enhances c-AMP) can work synergistically with iNO (which enhances c-GMP); endothelin receptors antagonists can work synergistically with iNO. After recovery, consider evaluation for central nervous system (CNS) injury by performing brain computed tomography (CT) scanning or magnetic resonance imaging (MRI). Advise a complete examination for the patient by a neurologist or a developmental pediatrician after discharge, as the incidence of significant neurodevelopmental impairment is 25%. Since the prevalence of hearing loss is high, order an automated hearing test before discharging the patient. Newborns recovering from persistent pulmonary hypertension of the newborn often feed poorly for several days or weeks. Nasogastric (NG) feeding is frequently required to support the newborn until oral feeding is established. Speech therapy may be helpful in reestablishing normal patterns of feeding. Owing to the high risk of neurodevelopmental impairment and sensorineural hearing loss, infants should be monitored closely for the first 2 years of life, preferably in a specialty follow-up clinic for developmental follow-up care. The pulmonary hypertension clinic also offers comprehensive evaluation and an individual treatment plan for patients with persistence of any level of pulmonary hypertension. Recommend complete screening before pediatric patients enter school, to determine if they have any subtle deficits that may predispose them to learning disabilities. Reassess the infant's hearing when he or she is aged 6 months and again as the results indicate. Late sensorineural hearing loss has been reported in a high percentage of patients. How is persistent pulmonary hypertension of the newborn (PPHN) defined? How is the diagnosis of persistent pulmonary hypertension of the newborn (PPHN) confirmed? What is fetal pulmonary hypertension? What is considered a normal cardiopulmonary transition at birth? What are symptoms of severe persistent pulmonary hypertension of the newborn (PPHN)? What is the prevalence of neurologic sequelae in persistent pulmonary hypertension of the newborn (PPHN)? What is persistent pulmonary hypertension of the newborn (PPHN)? What are the signs and symptoms of persistent pulmonary hypertension of the newborn (PPHN)? How is persistent pulmonary hypertension of the newborn (PPHN) diagnosed? What is the role of lab testing in the diagnosis of persistent pulmonary hypertension of the newborn (PPHN)? What is the role of imaging studies in the diagnosis of persistent pulmonary hypertension of the newborn (PPHN)? What is the role of cardiac catheterization in the diagnosis of persistent pulmonary hypertension of the newborn (PPHN)? What is the focus of treatment for persistent pulmonary hypertension of the newborn (PPHN)? What are general management principles for persistent pulmonary hypertension of the newborn (PPHN)? What is included in medical therapy for persistent pulmonary hypertension of the newborn (PPHN)? What is the role of drug treatment for persistent pulmonary hypertension of the newborn (PPHN)? What is the role of pulmonary endothelium-derived vasodilators in the etiology of persistent pulmonary hypertension of the newborn (PPHN)? What is the role of genetics in the etiology of persistent pulmonary hypertension of the newborn (PPHN)? What is the role of selective serotonin reuptake inhibitors (SSRIs) in the etiology of persistent pulmonary hypertension of the newborn (PPHN)? What are the most common causes of persistent pulmonary hypertension of the newborn (PPHN)? What causes acute pulmonary vasoconstriction in persistent pulmonary hypertension of the newborn (PPHN)? What causes hypoplasia of the pulmonary vascular bed in persistent pulmonary hypertension of the newborn (PPHN)? What is the role of idiopathic pulmonary hypertension in the etiology of persistent pulmonary hypertension of the newborn (PPHN)? What is the incidence of persistent pulmonary hypertension of the newborn (PPHN) in the US? What is the mortality rate for persistent pulmonary hypertension of the newborn (PPHN)? What is the focus of clinical history in the evaluation of persistent pulmonary hypertension of the newborn (PPHN)? What are physical findings suggestive of persistent pulmonary hypertension of the newborn (PPHN)? What is included in the differential diagnoses of persistent pulmonary hypertension of the newborn (PPHN)? What is the role of arterial blood gases (ABG) in the workup of persistent pulmonary hypertension of the newborn (PPHN)? What is the role of a CBC count in the workup of persistent pulmonary hypertension of the newborn (PPHN)? What is the role of serum electrolytes monitoring in the workup of persistent pulmonary hypertension of the newborn (PPHN)? What is the role of radiography in the workup of persistent pulmonary hypertension of the newborn (PPHN)? What is the role of echocardiography in the workup of persistent pulmonary hypertension of the newborn (PPHN)? What is the role of ultrasonography in the workup of persistent pulmonary hypertension of the newborn (PPHN)? What is the role of pulse oximetry in the workup of persistent pulmonary hypertension of the newborn (PPHN)? What is the role of cardiac catheterization in the workup of persistent pulmonary hypertension of the newborn (PPHN)? What is the focus of the initial treatment for persistent pulmonary hypertension of the newborn (PPHN)? What are the American Heart Association (AHA) and American Thoracic Society (ATS) treatment guidelines for persistent pulmonary hypertension of the newborn (PPHN)? What is the role of inotropic drugs in the treatment of persistent pulmonary hypertension of the newborn (PPHN)? What is the role of surfactant therapy in the treatment of persistent pulmonary hypertension of the newborn (PPHN)? What is the role of high-frequency ventilation (HFV) in the treatment of persistent pulmonary hypertension of the newborn (PPHN)? What is the role of extracorporeal membrane oxygenation (ECMO) in the treatment of persistent pulmonary hypertension of the newborn (PPHN)? Why has there been a reduction in the use of extracorporeal membrane oxygenation (ECMO) for treatment of persistent pulmonary hypertension of the newborn (PPHN)? What is the criterion for institution of extracorporeal membrane oxygenation (ECMO) for persistent pulmonary hypertension of the newborn (PPHN)? When is transfer to an extracorporeal membrane oxygenation (ECMO) center indicated for the treatment of persistent pulmonary hypertension of the newborn (PPHN)? What is the danger for infants with persistent pulmonary hypertension of the newborn (PPHN) who have a partial response to inhaled nitric oxide (iNO)? Where can guidelines be found for the transfer to an extracorporeal membrane oxygenation (ECMO) center for the treatment of persistent pulmonary hypertension of the newborn (PPHN)? What are baseline criteria for extracorporeal membrane oxygenation (ECMO) in the treatment of persistent pulmonary hypertension of the newborn (PPHN)? What is the role of mechanical ventilation in the treatment and management of persistent pulmonary hypertension of the newborn (PPHN)? What is the role of sodium bicarbonate in the treatment of persistent pulmonary hypertension of the newborn (PPHN)? What is the role of paralytic agents in the treatment of persistent pulmonary hypertension of the newborn (PPHN)? What is the role of nitric oxide (NO) for treatment of persistent pulmonary hypertension of the newborn (PPHN)? What is the efficacy of inhaled nitric oxide (iNO) for the treatment of persistent pulmonary hypertension of the newborn (PPHN)? What are contraindications to inhaled nitric oxide (iNO) for the treatment of persistent pulmonary hypertension of the newborn (PPHN)? What is the initial recommended concentration of inhaled nitric oxide (iNO) for the treatment of persistent pulmonary hypertension of the newborn (PPHN)? How quickly do infants respond to inhaled nitric oxide (iNO) for treatment of persistent pulmonary hypertension of the newborn (PPHN)? How does severe parenchymal lung disease affect the treatment of persistent pulmonary hypertension of the newborn (PPHN)? What are considerations for inhaled nitric oxide (iNO) in centers that do not have immediate availability of extracorporeal membrane oxygenation (ECMO) for treatment of persistent pulmonary hypertension of the newborn (PPHN)? What is the role of prostacyclin in the treatment of persistent pulmonary hypertension of the newborn (PPHN)? What is the role of sildenafil in the treatment of persistent pulmonary hypertension of the newborn (PPHN)? What is the role of bosentan in the treatment of persistent pulmonary hypertension of the newborn (PPHN)? Which medications are under investigation for the treatment of persistent pulmonary hypertension of the newborn (PPHN)? How is CNS injury evaluated following treatment for persistent pulmonary hypertension of the newborn (PPHN)? What is the role of nasogastric (NG) feeding in the management of persistent pulmonary hypertension of the newborn (PPHN)? What monitoring is required following treatment for persistent pulmonary hypertension of the newborn (PPHN)? Cabral JE, Belik J. Persistent pulmonary hypertension of the newborn: recent advances in pathophysiology and treatment. J Pediatr (Rio J). 2013 May-Jun. 89(3):226-42. [Medline]. Bahrami KR, Van Meurs KP. ECMO for neonatal respiratory failure. Semin Perinatol. 2005 Feb. 29(1):15-23. [Medline]. Farrow KN, Fliman P, Steinhorn RH. The diseases treated with ECMO: focus on PPHN. Semin Perinatol. 2005 Feb. 29(1):8-14. [Medline]. Fuloria M, Aschner JL. Persistent pulmonary hypertension of the newborn. Semin Fetal Neonatal Med. 2017 Aug. 22 (4):220-6. [Medline]. Mathew B, Lakshminrusimha S. Persistent pulmonary hypertension in the newborn. Children (Basel). 2017 Jul 28. 4 (8):63. [Medline]. Cassin S, Dawes GS, Mott JC, Ross BB, Strang LB. The vascular resistance of the foetal and newly ventilated lung of the lamb. J Physiol. 1964 May. 171:61-79. [Medline]. [Full Text]. Dawes GS, Mott JC, Widdicombe JG, Wyatt DG. Changes in the lungs of the new-born lamb. J Physiol. 1953 Jul. 121(1):141-62. [Medline]. Berti A, Janes A, Furlan R, Macagno F. High prevalence of minor neurologic deficits in a long-term neurodevelopmental follow-up of children with severe persistent pulmonary hypertension of the newborn: a cohort study. Ital J Pediatr. 2010 Jun 13. 36:45. [Medline]. [Full Text]. Schmidt HH, Schmidt PM, Stasch JP. NO- and haem-independent soluble guanylate cyclase activators. Handb Exp Pharmacol. 2009. 191:309-39. [Medline]. Stasch JP, Hobbs AJ. NO-independent, haem-dependent soluble guanylate cyclase stimulators. Handb Exp Pharmacol. 2009. (191):277-308. [Medline]. Jaillard S, Larrue B, Deruelle P, et al. Effects of phosphodiesterase 5 inhibitor on pulmonary vascular reactivity in the fetal lamb. Ann Thorac Surg. 2006 Mar. 81(3):935-42. [Medline]. Villamor E, Le Cras TD, Horan MP, Halbower AC, Tuder RM, Abman SH. Chronic intrauterine pulmonary hypertension impairs endothelial nitric oxide synthase in the ovine fetus. Am J Physiol. 1997 May. 272(5 Pt 1):L1013-20. [Medline]. Hanson KA, Ziegler JW, Rybalkin SD, Miller JW, Abman SH, Clarke WR. Chronic pulmonary hypertension increases fetal lung cGMP phosphodiesterase activity. Am J Physiol. 1998 Nov. 275(5 Pt 1):L931-41. [Medline]. Pearson DL, Dawling S, Walsh WF, et al. Neonatal pulmonary hypertension--urea-cycle intermediates, nitric oxide production, and carbamoyl-phosphate synthetase function. N Engl J Med. 2001 Jun 14. 344(24):1832-8. [Medline]. Kaluarachchi DC, Smith CJ, Klein JM, Murray JC, Dagle JM, Ryckman KK. Polymorphisms in urea cycle enzyme genes are associated with persistent pulmonary hypertension of the newborn. Pediatr Res. 2017 Oct 4. [Medline]. Jain L, Eaton DC. Physiology of fetal lung fluid clearance and the effect of labor. Semin Perinatol. 2006 Feb. 30(1):34-43. [Medline]. US food and drug administration. FDA Drug Safety Communication: Selective serotonin reuptake inhibitor (SSRI) antidepressant use during pregnancy and reports of a rare heart and lung condition in newborn babies. Available at http://www.fda.gov/drugs/drugsafety/ucm283375.htm. Accessed: December 14, 2011. Teng RJ, Wu TJ. Persistent pulmonary hypertension of the newborn. J Formos Med Assoc. 2013 Apr. 112(4):177-84. [Medline]. Babooa N, Shi WJ, Chen C. Factors relating caesarean section to persistent pulmonary hypertension of the newborn. World J Pediatr. 2017 Dec. 13 (6):517-27. [Medline]. Atkinson JB, Ford EG, Kitagawa H, Lally KP, Humphries B. Persistent pulmonary hypertension complicating cystic adenomatoid malformation in neonates. J Pediatr Surg. 1992 Jan. 27(1):54-6. [Medline]. Robin H Steinhorn, MD and Kathryn N Farrow, MD, PhD. Pulmonary hypertension in the neonate. NeoReviews. January 1, 2007. 8:e14 -e21. [Full Text]. Steurer MA, Jelliffe-Pawlowski LL, Baer RJ, Partridge JC, Rogers EE, Keller RL. Persistent pulmonary hypertension of the newborn in late preterm and term infants in California. Pediatrics. 2017 Jan. 139 (1):e20161165. [Medline]. Konduri GG, Vohr B, Robertson C, et al, for the Neonatal Inhaled Nitric Oxide Study Group. Early inhaled nitric oxide therapy for term and near-term newborn infants with hypoxic respiratory failure: neurodevelopmental follow-up. J Pediatr. 2007 Mar. 150 (3):235-40, 240.e1. [Medline]. Weijerman ME, van Furth AM, van der Mooren MD, et al. Prevalence of congenital heart defects and persistent pulmonary hypertension of the neonate with Down syndrome. Eur J Pediatr. 2010 Oct. 169(10):1195-9. [Medline]. Sallaam S, Natarajan G, Aggarwal S. Persistent pulmonary hypertension of the newborn with D-transposition of the great arteries: management and prognosis. Congenit Heart Dis. 2015 Nov 11. [Medline]. Sagheb S, Sepidarkish M, Mohseni SO, Movahedian A, Mosayebi Z. Red cell distribution width as a predictor of persistent pulmonary hypertension of the newborn. Am J Perinatol. 2017 Dec. 34 (14):1442-6. [Medline]. Malowitz JR, Forsha DE, Smith PB, Cotten CM, Barker PC, Tatum GH. Right ventricular echocardiographic indices predict poor outcomes in infants with persistent pulmonary hypertension of the newborn. Eur Heart J Cardiovasc Imaging. 2015 Nov. 16 (11):1224-31. [Medline]. Lotze A, Mitchell BR, Bulas DI, Zola EM, Shalwitz RA, Gunkel JH. Multicenter study of surfactant (beractant) use in the treatment of term infants with severe respiratory failure. Survanta in Term Infants Study Group. J Pediatr. 1998 Jan. 132(1):40-7. [Medline]. Findlay RD, Taeusch HW, Walther FJ. Surfactant replacement therapy for meconium aspiration syndrome. Pediatrics. 1996 Jan. 97(1):48-52. [Medline]. Brown KL, Sriram S, Ridout D, et al. Extracorporeal membrane oxygenation and term neonatal respiratory failure deaths in the United Kingdom compared with the United States: 1999 to 2005. Pediatr Crit Care Med. 2010 Jan. 11(1):60-5. [Medline]. Hintz SR, Suttner DM, Sheehan AM, Rhine WD, Van Meurs KP. Decreased use of neonatal extracorporeal membrane oxygenation (ECMO): how new treatment modalities have affected ECMO utilization. Pediatrics. 2000 Dec. 106(6):1339-43. [Medline]. Christou H, Van Marter LJ, Wessel DL, et al. Inhaled nitric oxide reduces the need for extracorporeal membrane oxygenation in infants with persistent pulmonary hypertension of the newborn. Crit Care Med. 2000 Nov. 28(11):3722-7. [Medline]. Lazar DA, Cass DL, Olutoye OO, et al. The use of ECMO for persistent pulmonary hypertension of the newborn: a decade of experience. J Surg Res. 2012 Oct. 177(2):263-7. [Medline]. Walsh-Sukys MC, Tyson JE, Wright LL, et al. Persistent pulmonary hypertension of the newborn in the era before nitric oxide: practice variation and outcomes. Pediatrics. 2000 Jan. 105(1 Pt 1):14-20. [Medline]. Laffey JG, Engelberts D, Kavanagh BP. Injurious effects of hypocapnic alkalosis in the isolated lung. Am J Respir Crit Care Med. 2000 Aug. 162(2 Pt 1):399-405. [Medline]. Wung JT, James LS, Kilchevsky E, James E. Management of infants with severe respiratory failure and persistence of the fetal circulation, without hyperventilation. Pediatrics. 1985 Oct. 76(4):488-94. [Medline]. American Academy of Pediatrics. Committee on Fetus and Newborn. Use of inhaled nitric oxide. Pediatrics. 2000 Aug. 106(2 Pt 1):344-5. [Medline]. Kinsella JP, Walsh WF, Bose CL, et al. Inhaled nitric oxide in premature neonates with severe hypoxaemic respiratory failure: a randomised controlled trial. Lancet. 1999 Sep 25. 354(9184):1061-5. [Medline]. Davidson D, Barefield ES, Kattwinkel J, et al. Inhaled nitric oxide for the early treatment of persistent pulmonary hypertension of the term newborn: a randomized, double-masked, placebo-controlled, dose-response, multicenter study. The I-NO/PPHN Study Group. Pediatrics. 1998 Mar. 101(3 Pt 1):325-34. [Medline]. Clark RH, Kueser TJ, Walker MW, et al. Low-dose nitric oxide therapy for persistent pulmonary hypertension of the newborn. Clinical Inhaled Nitric Oxide Research Group. N Engl J Med. 2000 Feb 17. 342(7):469-74. [Medline]. Pawlik TD, Porta NF, Steinhorn RH, Ogata E, deRegnier RA. Medical and financial impact of a neonatal extracorporeal membrane oxygenation referral center in the nitric oxide era. Pediatrics. 2009 Jan. 123(1):e17-24. [Medline]. Barst RJ, Rubin LJ, Long WA, et al. A comparison of continuous intravenous epoprostenol (prostacyclin) with conventional therapy for primary pulmonary hypertension. N Engl J Med. 1996 Feb 1. 334(5):296-301. [Medline]. Barst RJ, Rubin LJ, McGoon MD, Caldwell EJ, Long WA, Levy PS. Survival in primary pulmonary hypertension with long-term continuous intravenous prostacyclin. Ann Intern Med. 1994 Sep 15. 121(6):409-15. [Medline]. Ahsman MJ, Witjes BC, Wildschut ED, et al. Sildenafil exposure in neonates with pulmonary hypertension after administration via a nasogastric tube. Arch Dis Child Fetal Neonatal Ed. 2010 Mar. 95(2):F109-14. [Medline]. Nair J, Lakshminrusimha S. Update on PPHN: mechanisms and treatment. Semin Perinatol. 2014 Mar. 38 (2):78-91. [Medline]. Shah PS, Ohlsson A. Sildenafil for pulmonary hypertension in neonates. Cochrane Database Syst Rev. 2007 Jul 18. CD005494. [Medline]. Shah PS, Ohlsson A. Sildenafil for pulmonary hypertension in neonates. Cochrane Database Syst Rev. 2011 Aug 10. CD005494. [Medline]. Abman SH, Kinsella JP, Rosenzweig EB, et al. Implications of the U.S. Food and Drug Administration warning against the use of sildenafil for the treatment of pediatric pulmonary hypertension. Am J Respir Crit Care Med. 2013 Mar 15. 187(6):572-5. [Medline]. Perez KM, Laughon M. Sildenafil in term and premature infants: a systematic review. Clin Ther. 2015 Nov 1. 37 (11):2598-2607.e1. [Medline]. McNamara PJ, Laique F, Muang-In S, Whyte HE. Milrinone improves oxygenation in neonates with severe persistent pulmonary hypertension of the newborn. J Crit Care. 2006 Jun. 21 (2):217-22. [Medline]. Dakshinamurti S. Pathophysiologic mechanisms of persistent pulmonary hypertension of the newborn. Pediatr Pulmonol. 2005 Jun. 39(6):492-503. [Medline]. Abman SH. Role of endothelin receptor antagonists in the treatment of pulmonary arterial hypertension. Annu Rev Med. 2009. 60:13-23. [Medline]. Galie N, Rubin Lj, Hoeper M, et al. Treatment of patients with mildly symptomatic pulmonary arterial hypertension with bosentan (EARLY study): a double-blind, randomised controlled trial. Lancet. 2008 Jun 21. 371(9630):2093-100. [Medline]. Liu C, Chen J, Gao Y, Deng B, Liu K. Endothelin receptor antagonists for pulmonary arterial hypertension. Cochrane Database Syst Rev. 2009 Jul 8. CD004434. [Medline]. Mohamed WA, Ismail M. A randomized, double-blind, placebo-controlled, prospective study of bosentan for the treatment of persistent pulmonary hypertension of the newborn. J Perinatol. 2012 Aug. 32 (8):608-13. [Medline]. Humbert M, Segal ES, Kiely DG, Carlsen J, Schwierin B, Hoeper MM. Results of European post-marketing surveillance of bosentan in pulmonary hypertension. Eur Respir J. 2007 Aug. 30(2):338-44. [Medline]. Oka M, Fagan KA, Jones PL, McMurtry IF. Therapeutic potential of RhoA/Rho kinase inhibitors in pulmonary hypertension. Br J Pharmacol. 2008 Oct. 155(4):444-54. [Medline]. [Full Text]. Iseri LT, French JH. Magnesium: nature's physiologic calcium blocker. Am Heart J. 1984 Jul. 108(1):188-93. [Medline]. Hernandez-Diaz S, Van Marter LJ, Werler MM, Louik C, Mitchell AA. Risk factors for persistent pulmonary hypertension of the newborn. Pediatrics. 2007 Aug. 120(2):e272-82. [Medline]. Steinhorn RH, Kinsella JP, Pierce C, et al. Intravenous sildenafil in the treatment of neonates with persistent pulmonary hypertension. J Pediatr. 2009 Dec. 155(6):841-847.e1. [Medline]. Yoder BA, Kirsch EA, Barth WH, Gordon MC. Changing obstetric practices associated with decreasing incidence of meconium aspiration syndrome. Obstet Gynecol. 2002 May. 99(5 Pt 1):731-9. [Medline]. Yeh TF. Core concepts: Meconium aspiration syndrome: Pathogenesis and current management. NeoReviews. 2010 Sep. 11(9):e503-12. [Full Text]. Silva DM, Nardiello C, Pozarska A, Morty RE. Recent advances in the mechanisms of lung alveolarization and the pathogenesis of bronchopulmonary dysplasia. Am J Physiol Lung Cell Mol Physiol. 2015 Dec 1. 309 (11):L1239-72. [Medline]. Konduri GG, Solimano A, Sokol GM, et al. A randomized trial of early versus standard inhaled nitric oxide therapy in term and near-term newborn infants with hypoxic respiratory failure. Pediatrics. 2004 Mar. 113(3 Pt 1):559-64. [Medline]. Steinhorn RH. Nitric oxide and beyond: new insights and therapies for pulmonary hypertension. J Perinatol. 2008 Dec. 28 Suppl 3:S67-71. [Medline]. Brauser D. Moms' SSRI use linked to pulmonary hypertension in newborns. Medscape Medical News. January 16, 2014. Available at http://www.medscape.com/viewarticle/819326. Accessed: January 27, 2014. Grigoriadis S, Vonderporten EH, Mamisashvili L, et al. Prenatal exposure to antidepressants and persistent pulmonary hypertension of the newborn: systematic review and meta-analysis. BMJ. 2014 Jan 14. 348:f6932. [Medline]. Hughes Driscoll CA, Davis NL, Miles M, El-Metwally D. A quality improvement project to improve evidence-based inhaled nitric oxide use. Respir Care. 2018 Jan. 63 (1):20-7. [Medline]. Dani C, Corsini I, Cangemi J, Vangi V, Pratesi S. Nitric oxide for the treatment of preterm infants with severe RDS and pulmonary hypertension. Pediatr Pulmonol. 2017 Nov. 52 (11):1461-8. [Medline].